What is the most successful game ever made with Gamesalad? — Welcome to the GameSalad forum! What is the most successful game ever made with Gamesalad? I've been very curious as to what has been made with Gamesalad. It is a great mobile game development platform...I love it! I've seen the amazing things it can do. Some of the games in the "Game of the month" thread are amazingly complex. This sparked a growing curiosity inside me. What has been the most successful game made with Gamesalad? Are there "big name" mobile development companies that use Gamesalad as their engine? Use this thread to discuss the success of Gamesalad!!! I can't think of one big app dev company that uses gamesalad. Or even a medium sized one. But lots of GS games get featured in the App Stores. People generally don't post their money or number of downloads on a continual basis. Hard to say which one has done the best. This would be great to know how people are doing here or how well they have done before. @Triangularity Games Search the Forum for the several threads on " Roll Turtle" by @kirafu to read about creativity, blood, sweat and tears, persistence and success of what may well end up being the most famous app created with GameSalad. $30,000 a day in sales if I remember correctly. If I remeber correctly (there should be a thread somewhere) when he hit $30k/day it lasted for a couple of weeks or so, but I expect as the game drifted down the charts he was still making good money. Wow. I didn't expect this much enthusiasm. I love it! Thanks, I think it will be interesting to see where Gamesalad goes in the future. that said... most games make nothing up to a couple of cents a month.. Nothing to do with game salad tough. It's a nice game. It was well done. I played it. It's a different market today. In what way would you say the market is different? Over saturation? Multiple ways. The longer f2p has been around the less people are willing to pay for games, even for a buck. Hundreds of apps added every day. Even great games don't get noticed. i thought the same when I saw the game. F2P also bringing back the riven / myst type of games was probably more niche back then, plus the pre-rendered art which looks specially nice in comparison to mobile games back then.. Now some big studios have similar titles out there. And now look at his rating position in the US. Thats still freaking solid after 7 years of having the game out there. It keeps reminding that once you get a solid spot through a feature or push into the top rankings your game will continue doing pretty getting traffic as it reaches top position in keyword rankings. Also the ratings took off 2 years after its launch. So probably a good update that also helped keeping it up. @BigDave - if my memory serves me correctly Joe made Grisly Manor free for a period of time when he released his follow up game The Lost City, so that probably accounts for the download/review spike. 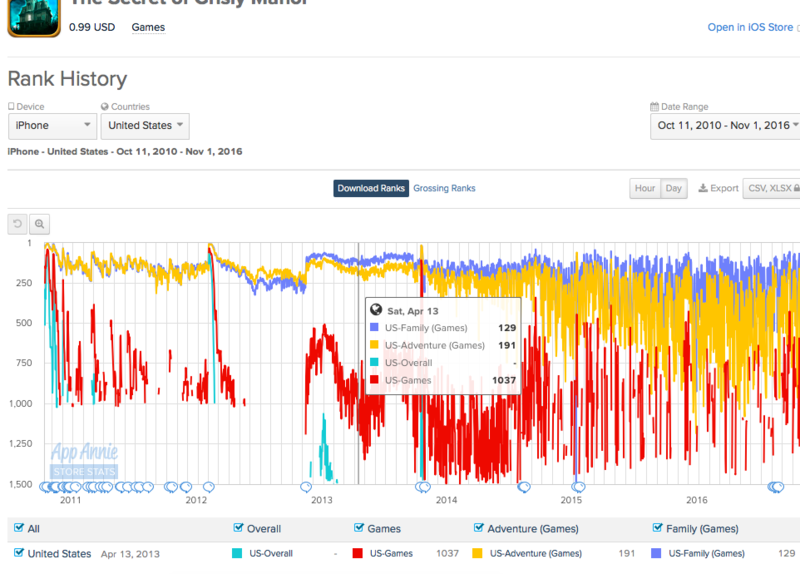 If you think Grisly Manor did well you should checkout The Lost City - it was the number 1 paid game around the world! (though he'd moved on from GS at this point). Both are fantastic games by the way! Flappy Cyrus was at the top of the worldwide charts for quite a few days. Sadly, that's one of the most successful GS games. Any others? We should share and celebrate our successes! 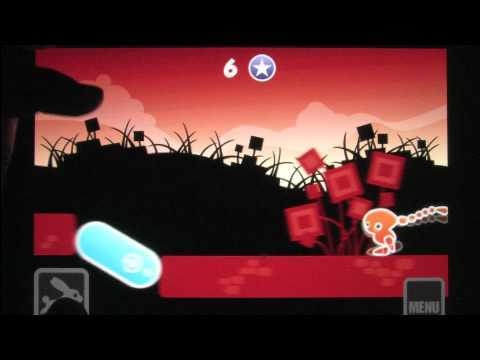 As to firemaplegames, one must to remember his game was out in the very early days of idevices. The market was much much thinner back then. Way less developers and apps. My first app was released during the ipad 1 release. Things were much different back then. Wanted to join in here, but what I was thinking was not what was the most successful game made with game salad but what was a really successful game that could have been made with game salad! And instantly came to mind,,,, Five Nights At Freddys! So you have to think to yourself, don't worry about what games are successful with GameSalad just worry about making a successful game! Five nights has no collision rules so could easily be ported to html5 and then an exe for steam etc GameSalad is quite versatile depending on your game! We had 2 top 20 hits in the apple US store, Bumps (3 months to make the initial game then added more levels and mini games) got some nice reviews from touch arcade and appspy etc. Bumps had loads of unlockable mini games like 1 or 2 player breakout, air hockey, single player shooter, skiing etc etc. Red ball of goo (made in under 24 hours). Stopped developing a long time ago so they're not on the stores anymore but old timers might remember them. One of my favourite games was Running Wild but sadly we didn't make any money. Pretty sure all the real money was made after Fire Maple Games had switched to Corona. Completely rebuilt the game from the ground up! Vastly improved loading times throughout. The "black screen" issues that some people were experiencing have been resolved as well. Warning: You will lose your current saved progress when you install this new version. Yes they switched and made some steam games on corona sdk. GameSalad is a great tool for rapid development, each step is important in the journey. It depends on what you consider success. If it's just money wasn't there some bouncing red ball game made with A Gamesalad template that paid for downloads and got to the number one free spot for a week or so? 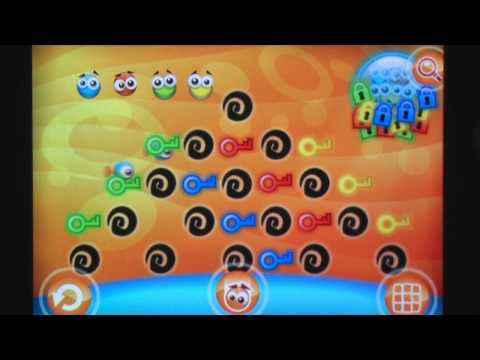 However if you are looking for success as well made games that got good coverage and were received well, I know quantumnsheep made a handful of great games that got a lot of coverage and Apple features that people loved. I think he maybe even did it full time and is now on to using unity and has a new game coming out soon. 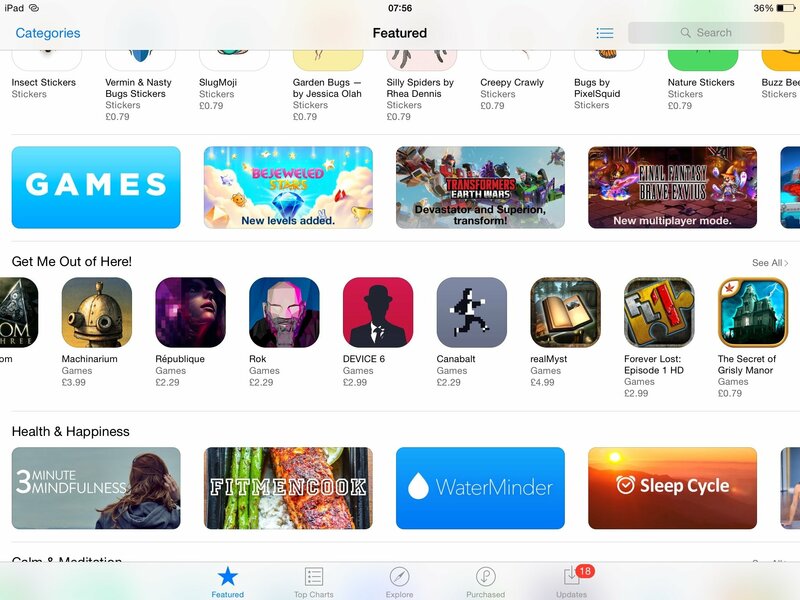 Back on the front page of the (UK) AppStore today . . . I was wondering why it was climbing up in the UK... :-) very cool! The most Grisly Manor made in a single day was around $3500. Not 30K, - but still crazy amazing. Whoops not sure where I got the $30k figure from, maybe it was your weekly earnings (? ), anyhow like you say still pretty amazing.